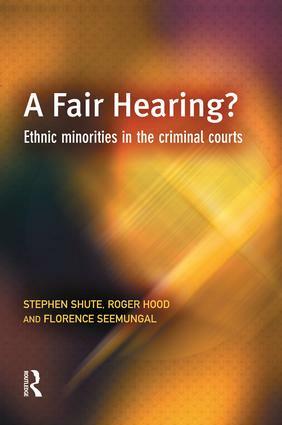 This book reports on research which investigates the perceptions of ethnic minorities concerning their treatment in the criminal courts. It examines the extent to which ethnic minority defendants and witnesses in both the Crown Court and the magistrates' courts perceived their treatment to have been unfair, whether they believed any unfairness to have been the result of ethnic bias, and whether this had affected their confidence in the criminal courts. The study, carried out by the Oxford Centre for Criminological Research in association with the University of Birmingham for the Lord Chancellor's Department, involved observations of cases and interviews with more than a thousand people (defendants, witnesses, barristers, solicitors, judges, magistrates and others), and focused on courts in Manchester, Birmingham and London. A Fair Hearing? Ethnic minorities in the criminal courts begins by showing how widely held the belief has been that ethnic minorities are discriminated against by the courts and by other agencies in the criminal justice system. It discusses the factors that contributed to this belief, including the findings of the Macpherson Report and the notion of 'institutional racism'. The main part of the book then looks at the institutional setting in which the research took place, the experience of defendants and witnesses, their views about how they were treated by the criminal courts, and the views of others involved in the court process. Final chapters in the book address the issue of sensitivity to ethnicity on the part of judges, magistrates and lawyers. It shows that attitudes and practices are perceived to have changed for the better and examines what more needs to be done to increase the confidence that members of ethnic minorities have in the fairness of the criminal courts.